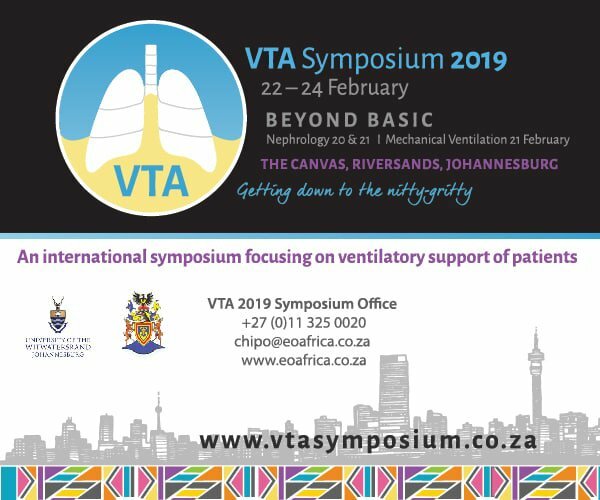 The 2019 iteration of the VTA Symposium will focus on optimising ventilatory support for patients. Growing awareness of the complexity of the management of critically ill patients has led to competence in mechanical ventilation and organ support being considered a basic requirement in many fields of healthcare. VTA 11 will continue a proud tradition of advancing knowledge in the field of ventilation and organ support in critically ill patients. VTA proudly presents the very latest developments in this ever-evolving field. The programme will span the entire spectrum from basic respiratory physiology to extracorporeal gas exchange, while simultaneously taking the time to reflect on some thought-provoking ethical topics. The closing date for online registration is 6 February. Register 6 delegates and receive 1 complimentary registration. Access to all scientific sessions, refreshment breaks and lunches during the Symposium (served in the exhibition area), limited drinks during meals. Accommodation, transfers, and Workshops. All rates are inclusive of VAT at 15%.